Reveals many reasons why we should not just accept the promises of a technological paradise without reflecting on its consequences. 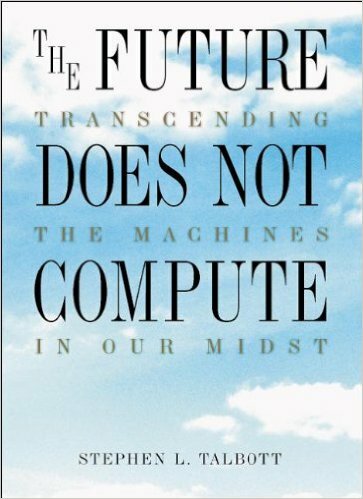 Stephen Talbott's The Future Does Not Compute has been widely touted as a neo-Luddite anti-computer tract. This sort of pigeonholing makes it easy to ignore the profound and disturbing questions Talbott raises about our machine-dominated society. The author brings years of computer and Internet experience to the table, leavened by a deep skepticism of techno-idealism, disdain of muddy thinking, and fear that we have embraced an overwhelming force before we've begun to examine its implications. Is technology a utopian delusion that blinds us to social and personal reality? Does the information society actually disdain information? Have we anthropomorphized machines to the point where our institutions resemble them? Talbott neither expects that computers will vanish, nor believes they should. What he asks of us is to examine closely our own humanity. As much as computer believers may squirm, it's hard to elude the questions raised by this complex and intelligent book. :) "... the author presents many reasons why we should not just accept the promises of a technological paradise without reflecting on its consequences." :) "Talbott succeeds in tying it all together to support a thesis that goes something like this: Each day we hear (and perhaps even sing) the praises of computers and network technology." :? "... I found myself thinking more deeply than ever before about the role of computers in modern life." :? "The most distressing thing about The Future Does Not Compute is that I actually agree with quite a lot of what Talbott has to say ..."
:? "Talbott has articulated the dangers of this trend in a few pithy chapters ..."
Stephen L. Talbott is a senior researcher at the Nature Institute and the editor of NetFuture, an online newsletter about technology and human responsibility which the New York Times has called an “undiscovered national treasure.” Mr. Talbott also serves as editor of In Context, the Nature Institute’s twice-yearly hardcopy journal. Before coming to the Nature Institute, Mr. Talbott did software work and technical writing for engineering organizations of computer manufacturers, ran a family organic farm in Oregon, and completed academic work in philosophy. Mr. Talbott’s primary undertaking right now is a critique of conventional science with a view toward establishing the foundations of a new, qualitative science. This project, which requires an extraordinarily radical assessment of contemporary habits of thought, is discussed in more detail on the Nature Institute’s website here.